Bush Business Furniture (BBF) is the commercial furniture division of Bush Industries, Inc., and they are focused on providing commercial-grade workplace furnishing solutions for small and mid-sized businesses, with an additional focus on the serious office-at-home professional. 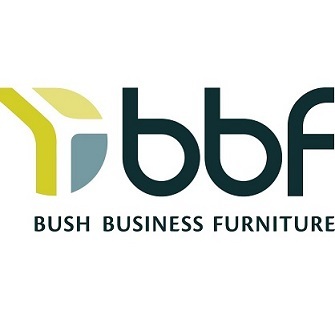 Bush Industries rebranded its commercial furniture division as BBF (Bush Business Furniture). With BBF, Bush is taking a new approach to the commercial market that includes continuing to design, develop and enhance products and services -- all with the quality, value and convenience upon which Bush has built its reputation. To ensure the design of durable office furniture BBF products will be subject to and required to pass applicable industry standard ANSI/BIFMA performance standards. BIFMA, along with ANSI, develops, maintains, and publishes safety and performance standards for office furniture products. Bush case goods and office desks are economical ready-to-assemble workspaces designed for both the commercial and home office. Office products that are assembled into larger configurations will use simple tools, such as a Philips screwdriver. Large configurations can disassembled easily for moving or reconfiguration as a company grows. Warranties for Bush Business Furniture range from 10 years to a Limited Lifetime warranty giving customers a piece of mind that their office furniture will last well beyond the purchase date. When shopping for office furniture, keep BBF desks, hutches, file cabinets and other laminate products at the top of your list. Bookmark this page as more products are to be added soon!